Money money money; where are you? Several months searching on how to make money online I finished my internet plans. But I did not find any clue. I found some PTC websites and became very happy because they were offering 1$ for 1 minutes add. Every day I clicked on ads and watched them regularly but I didn’t get any payments. I was a fool that time and did everything to make money online. But I did fail; I have wasted almost 6 months on searching how to make money online and found nothing effective. Finally, I got something which worked for the first time.It was shareyt.com from where I earned my first income from internet. Although I it was too little money but I was happy that day when I received my payment about 26$. In next 5-6 days, I realized this 25-50$ is nothing and I should not waste my times to earn 25-30$. In the meantime, one of my uncles told me about odesk.com. I started to find appropriate work for me and bid. Luckily I got my first job there and realized how to earn money. Now I have few and little experience to teach others how to earn money online. Depending on your skills you can earn money in many ways. Here I am going to tell you about few best ways to earn money online. Tee Shirt Business: This is the best way to beginners who do not have any idea on how to make money online. If you have a creative mind and loves fashion world then Tee Shirt Business will be a great source to earn money from internet. Don’t be panic; you do not need a single penny to start your business. Just create fashionable tee shirt design. Teespring.com is waiting for you. They will take your design and will create your designed tee shirt and will sell your products also. See my posts about teespring.com and start to make money online with teespring.com. Making online Videos: Are you a good presenter? Can you Speak English fluently? Then what’s for waiting just go to fiverr.com. Create gigs and sell your videos for 5$ us. Clients will direct you to create the video. You will then create a catchy video according to your client’s requirement and will be paid for it. Don’t worry about HD cameras. Just borrow your friend’s iPhone for few times, make few sells of your gigs. Do it repeatedly and in next few days, you will be able to buy your own iPhone. You can also make money online from YouTube Video Marketing. You can do it free of cost. Start to make videos on anything that you knows well. Create Demonstration type videos and place Google Ads on your videos. You can make smart income from YouTube Videos. Thinking to start YouTube Video Marketing? Check my article on how to make money online with YouTube Videos. Freelancing: Are you are a tech lover people and knows any programming language? Or you are a CSE student who knows programming languages like C, C++, Visual Basic, CSS and HTML, PHP or anything else then there are lots of marketplaces to sell your merit. Go to www.odsk.com, peopleperhour.com, fiverr.com and start earning right now. You can sell your contents, do data entry work or anything on those websites. Blogging: In this post, blogging is going to be the last hence best way to make money online. Methods stated above are really very effective to make money online. There are milliards of peoples who are selling tee shirts and earning more than 3000$ per month. Two of my friends are doing freelance work and having a handsome earn of 5000$ per month. I was also a freelance writer and now I left everything and started blogging. The methods stated above without blogging are good only when you are physically okay. Whatever it is freelancing or video making or tee shirt selling, you will be paid right after completing the job. From those methods, you can earn as much as you work. But the scenario of blogging is totally different.In blogging neither will you get paid right after writing a blog post nor will you earn as much as you work now. You have to wait more than one or two months and your income will increase day by day. After 5 or 6 months you will have a smart income which never stops. If you get ill and can’t write for weeks your income will not stop. You will be amazed at seeing the income of any established blog. Visit shoutmeloud, can you imagine how much it generates per month? Here is the earing’s report of shoutmeloud. Blogging generates Royalty Income which never stops. If you have taken the right decision of starting a blog then see blogging section and ask me for any kind of help. 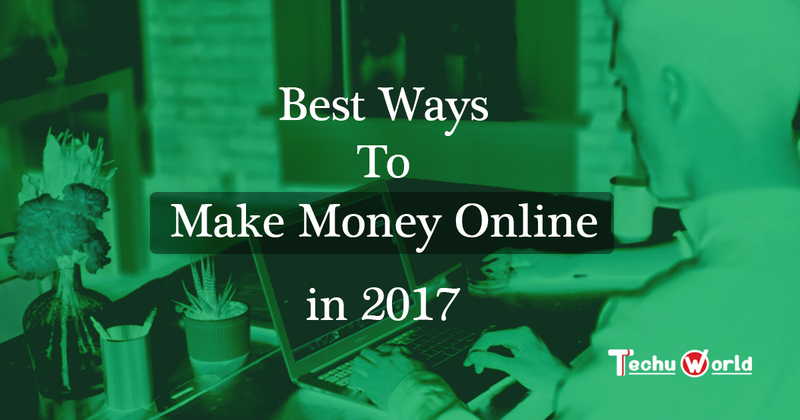 These were the best ways to make money online. There are lots of ways to make money online but you might not earn huge amount by other methods. I guess you have understood what is best for you. For a newbie guy I will suggest setting up a tee shirt selling business and if you have times and can wait for 2-3 to get your first income then I will strongly suggest you to start blogging right now. Because blogging is the best way to make money online.